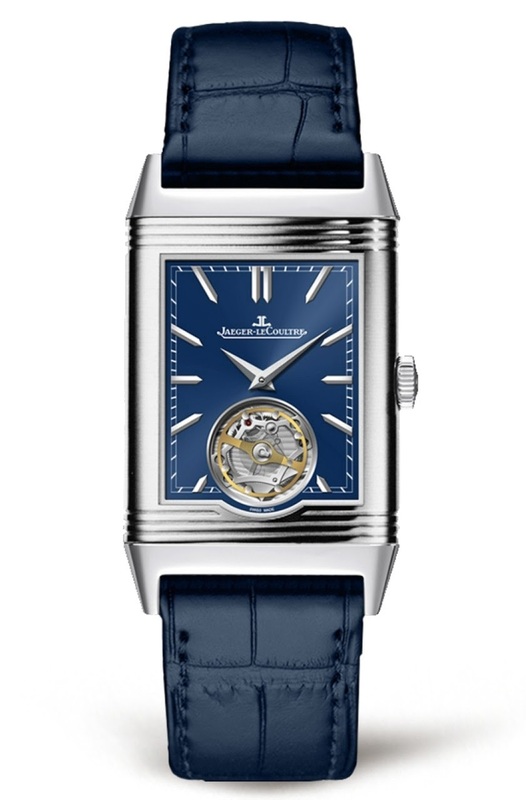 2018 Novelty: Jaeger Lecoultre Reverso Tribute Tourbillon. You like the Reverso Tribute Small Seconds and its awesome blue dial from this year's collection? 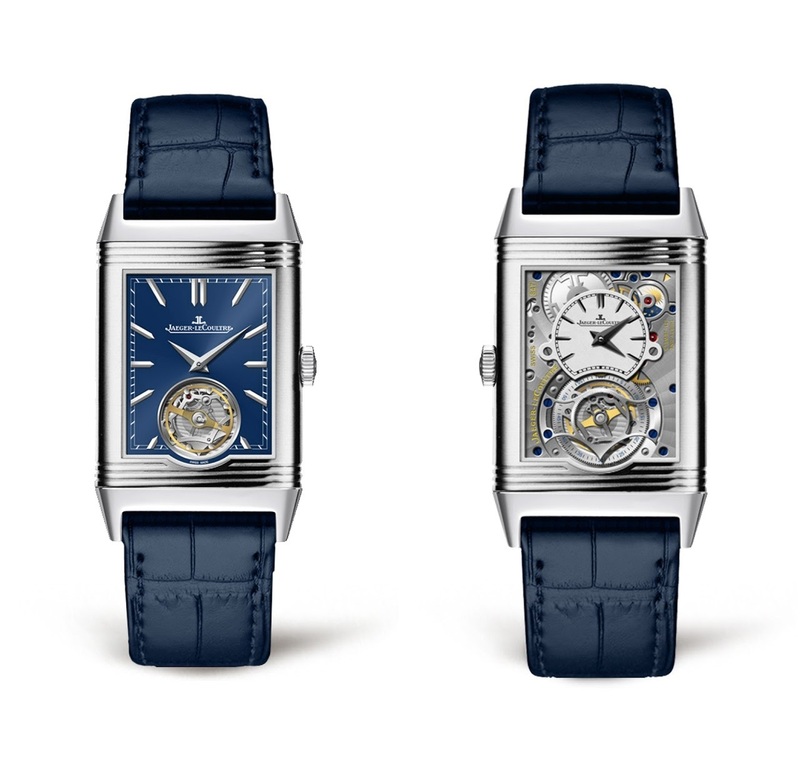 Or were you more after the Grande Reverso Duo Blue from some years ago? 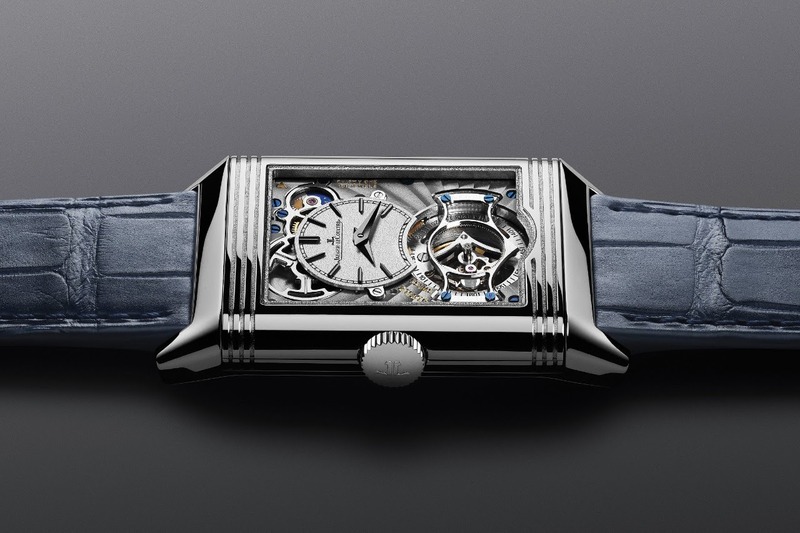 But as you are very picky, maybe you also liked the Reverso Tribute Gyrotourbillon, but in a more affordable version? 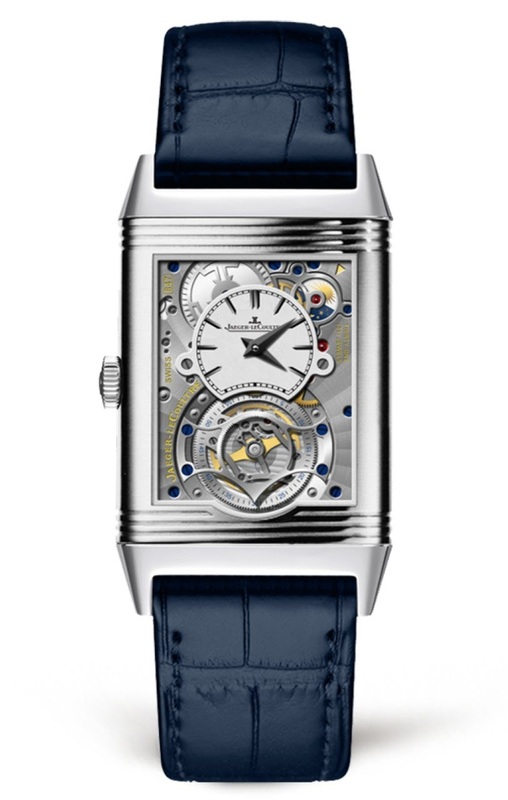 The new Jaeger Lecoultre Reverso Tribute Tourbillon unveiled a few days ago is for you, then. The case has some excellent ( from my point of view ) dimensions: 45, 5 x 27, 4 mm, and a reasonable thickness: 9, 15 mm. And good news, it is made of platinum, which pleases me a lot because it gives some very enjoyable density to watches which are not big. The recto shows a nice looking blue dial, offering a view on the tourbillon. A good or a bad thing, to see the tourbillon on the recto? I am not a big fan of any tourbillon making a hole in a dial. I much prefer when the tourbillon is fully part of the recto ( like on the Gyrotourbillons, or the Girard Perregaux Tourbillons with gold bridges, for example ) or when it is on the back side, for the exclusive and selfish pleasure of its owner. At least, her, you have a flying tourbillon, nicely made. As you may see, the blue dial has a sunburst decoration. With the applied indices, it is very elegant. The Verso is more conform to my taste. THIS is the way I like a tourbillon, when it is part of the decorum. I am waiting to see it in the metal, and to take some pictures, before any judgement on the level of decoration. But at least, from these press files pictures, it looks pleasant. You will notice the presence of a night and day indicator, on the top right part of the verso. The dial dedicated to the time is grained. Which seems to become a signature for Jaeger Lecoultre, and I will not complain about that. The movement is the Cal 847, beating at 21, 600 alternances per hour, and offering a power reserve of 38 hours, which is a bit short for a manual winding movement. It is a limited edition of 50 pieces, priced around 120, 000 USD. A nice object, for sure. Which raises a natural question for a Reverso: Which side do you prefer? Thanks for your opinion, Tom. Quoting you "it looks pleasant". No my friend: it looks fabulous! But at this price tag, it will stay a dream. I am pretty sure you will see it there! Let us know what you think, amigo. I would have preferred it to be without the hole on the dial side as with their first Reverso tourbillon. Outstanding all the same. I may be in love with the verso. But the round cutout in te recto is regrettable. Thanks for the writeup Nico!